Please refer to our stock # delil2L82Q when inquiring. 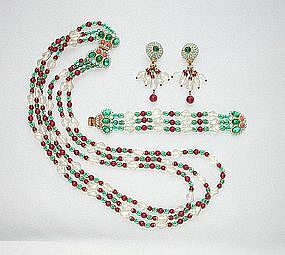 This gorgeous DeLillo set was designed by DeLillo's partner, Robert Clark, head designer for Miriam Haskell until the late 1960's when he joined DeLillo in creating some of the most exclusive and elegant costume jewelry of that time. Many pieces were made to order and all contined only finest materials and were hand crafted. This necklace, bracelet and earrings are of glass and heavy gold plate. We purchased this set from Mr. DeLillo's and Mr. Clark's personal collection. The necklace (long strand) is 32 1/2" end to end and the clasp is 1 1/4" by 1 3/4". The bracelet is 7 1/2" end to end and the clasp is 1 1/4" by 1 3/4". The clip earrings are 3" long measured from the top of the clip. The necklace, bracelet and one earring are marked DeLillo.